← A Benefit For New Beginnings Preschool and Child Care Inc.
WARSAW—Animal Welfare League Executive Director Darla McCammon has announced plans to retire. A search is underway for a qualified replacement. McCammon has given her intentions to retire to her board of directors. McCammon has won many awards, including the Rotary Pete Thorn award. She’s also won several awards in art, writing, and in marketing at AT&T. McCammon also writes a weekly Art in Action column. 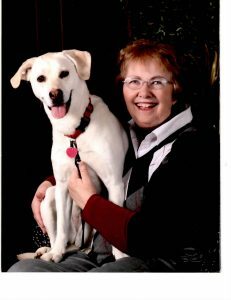 She does a Pet of the Week radio show on Willie 103.5, and has written several books, intending to finish the most recent titled The Lobstick Tree once she has more time during retirement. For that reason, McCammon asks anyone who might consider applying for this position to please send a resume to Woody Zimmerman, board President AWL at Warsaw Radio Stations. “The best candidate will have a degree, work experience in a not-for-profit organization, plus work experience in an animal shelter environment, and believe in a “no-kill” approach to animal shelters,” McCammon said.